Anna Kendrick and Blake Lively are pitch perfect as a pair of mismatched moms in Paul Feig's best movie to date. The notion of a “pastel Noir” story can’t help but be intriguing. On one hand, the nature of such an idea seems to run completely counter-intuitive to what most people think of as film noir. On the other hand, history demonstrates that film noir is, in fact, nothing if not versatile; sometimes shockingly so. But is there room for comedy? 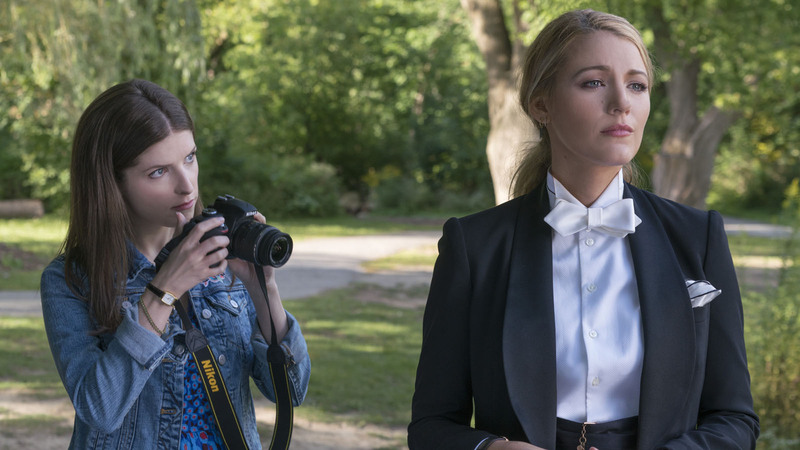 A Simple Favor, promoting itself as “the dark side of director Paul Feig” (Spy, The Heat, the Ghostbusters remake), doesn’t actually land all that firmly in the film noir/neo-noir camp. It happily careens far too off the rails for that. Which isn’t a bad thing, not really. What begins as a curiously percolating character study gives way to an engagingly convoluted murder mystery before settling into a mile-long explanation and frankly nutty resolution. Which is simply what most anyone would want from this particular creative conglomeration. And what a winning conglomeration it is! Feig demonstrates once and for all that he’s the number one male director of female-led movies. Notably, he does it this time completely without his perennial leading lady, Melissa McCarthy. Based on a novel by Darcey Bell and written for the screen by Jessica Sharzer, A Simple Favor is a bit off the well-beaten comedy path for Feig, but perhaps not as much as some of its straight-arrow marketing might have us believe. Amid the uncovered death and tragedy of the characters’ pasts, not to mention what unfolds in the story itself, there’s no shortage of levity. This being comedy director Feig’s most accomplished film to date, it should be less of a surprise that it’s an expert balance, and that he manages it extremely well. Anna Kendrick (the Pitch Perfect series) plays the aptly named Stephanie Smothers, a small-time mommy video blogger whose enthusiasm for life seems to know no ends. As a Greek chorus of exhausted parents (played by Andrew Rannells, Kelly McCormack and Aparna Nancherla) perpetually look and comment on as she volunteers for everything at her young son’s school, she meets fellow mom, Emily Nelson (Blake Lively, truly pitch perfect and never better). Emily, it’s fair to say, is not like the other parents. Though she’s stressed and haggard in her own way, she’s also enigmatic by design. She tends to dress to the nines, not unlike the men’s tuxedo-wearing styles of Morocco-era Marlene Dietrich. But also, she has a propensity to keep her face down in public. She’s a high-ranking rich professional in the fashion world, but hung up on the subject of her own perceived money troubles. Stephanie offers to watch Emily’s son after school, which leads to her doing so regularly. That leads to some unlikely mommy bonding, as Emily hosts Stephanie for stiff drinks in her sparse and angular glass box of a home. Emily swears freely, makes morbid comments, and coaches Stephanie to stop saying “sorry” at every turn. Stephanie reveals that virtually all of her adult relatives are dead, her husband and brother having perished together in a terrible car crash. Their personalities couldn’t be more different, nor more identifiable, but these ladies bond nonetheless. The moments of these two chatting together in the kitchen are some of the most effortless “hanging out” scenes in recent cinema. Then one day, Emily doesn’t pick up her son. Stephanie ends up taking care of him for days, until Emily’s husband (Henry Golding, continuing his Crazy Rich Asians quick ascension to stardom) comes home from an overseas trip. Then, Stephanie starts to bond with him. Hoo-boy. Anyhow, the plot thickens, sending Stephanie into full-blown Nancy Drew mode. Clues lead to more clues which lead to more questions which lead to more clues. Library visits, research, microfiche, revelations, driving to parts unknown, chatting up strangers and weirdos, more revelations... Yes, this is the obligatory portion of any Paul Feig movie that could stand to lose about twenty minutes. The resolution is handily a crowdpleaser, if not entirely in synch with what has successfully propelled A Simple Favor to this point of having viewers in the palm of its hand. Such was the case with the rash of early 1990’s would-be neo-noir, the sub-subsection of cinema that A Simple Favor most closely resembles. In that decade, the illicit and decadent tensions of Chinatown and Body Heat gave way to tales of suburban parents under duress in films such as The Hand That Rocks the Cradle, The Tie That Binds, and Consenting Adults. While A Simple Favor is superior to any of those latter post-Reagan movies, it seems to be nonetheless cut from the same cloth, albeit far more confidently. All of those 90’s films indulge their own knottiness in stupid, self-serious ways. A Simple Favor is just as convoluted as they are, if not more so, but has the good sense not to be straight-faced about it. A good time at the movies it is, but beneath its slick audience pleasing surface, A Simple Favor is the kind of movie that is more likely to implicate its audience than to embolden it. Odds are much higher that parents will identify with the stretched-thin exhaustion and wish for detachment of Emily than the perpetually perkiness of Stephanie. It’s just a question of which kind of “bubbly” applies most readily: booziness or personality. Between these two women, there’s plenty of both. “A Simple Favor,” as it turns out, is quite the throwaway moniker for this movie, the title gesture being but the imputes for the chain of increasingly wild mechanizations that follow. A pastel noir? Definitely more “pastel” than “noir”; but even so, the “dark side of Paul Feig” isn’t entirely lemon sprayed martinis and satin bed sheets. A Simple Favor is, like the contemporary comedies of its director, lacking in defined visual flourish, although uniquely, it acquits itself as a competently utilitarian murder mystery. And isn’t it true that in any given murder mystery, the expected question, of course, is, who the heck dunnit? What’s not expected is the question of who, if anyone, was murdered. If that’s saying too much, sorry/not sorry. Audiences ready for a memorable night out with a pair of mismatched and murdery mommies will want to happily turn to the dark side of Paul Feig soon enough.